As the busy mom of five young kids, that’s a question I’ve asked myself a million times! If you’re reading this post because you’re looking for help in taking care of yourself- especially in the area of working out consistently– I’m so glad you’re here! 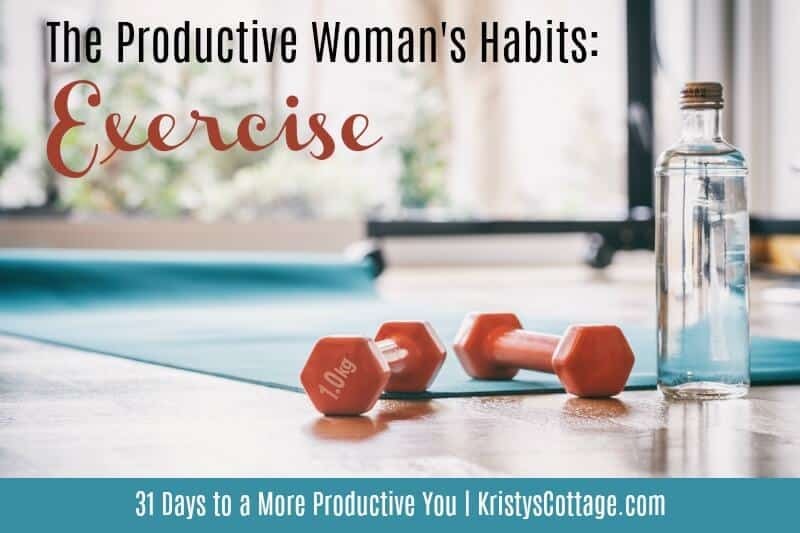 I think this post will help you with practical ideas for finding time- and motivation– to reach fitness goals, strengthen your body, and feel better. Welcome to the sixth “chapter” of my 31 Days to a More Productive blog series! 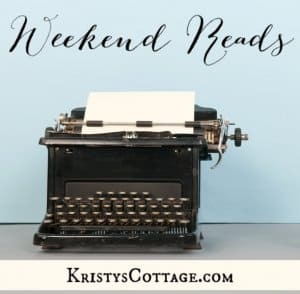 read everything I’ve written so far right here. check out quotes to share on social media right here. download today’s printable worksheets here. 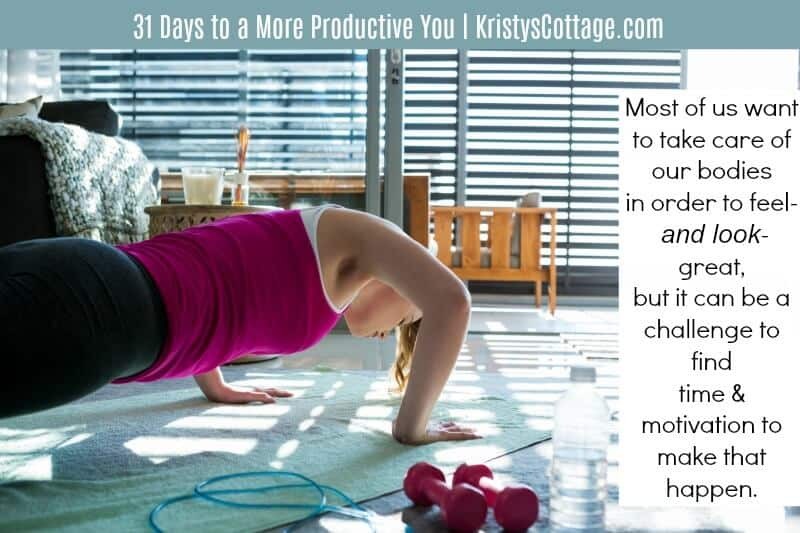 Today we’re talking about this very important habit of productivity- exercise. I’m not going to spend any time trying to convince that you need to exercise. So we all agree that exercising is so good for you, right? So why don’t we all work out every day? I’m sure you have your own struggles or challenges. I’m a homeschooling mom with five kids spanning preschool through eighth grade. I’m also a pastor’s wife, and I stay pretty busy wearing a lot of hats. Busy taking care of our families. Busy managing finances, homes, vehicles, and who knows that else. Most of us want to take care of our bodies and feel- and look– great, but it can be a challenge to find the time and motivation to make that happen. I’ve always known that I need to consistently workout in order to stay healthy and fit as a wife and mom. But I just never invested the time to develop a habit of working out on a regular basis. The turning point for me was my grandma’s death last August. The deep grief I had to process during that loss made me realize I needed an outlet- a physical outlet- for the difficult emotions I was dealing with. I decided it was now or never, and I started making time to work out. I’ll be honest: at first, I hated it! I’m not an athletic woman at all. I prefer books over athletic gear or weights, and a pedi over running any day of the week! My determination to make working out work made me press through the first several weeks of what felt like torture. I was SO sore, even though I was only using two-pound weights a few days a week! So how do we make time to keep our bodies active and fit, especially if we don’t really like to work out And we honestly feel like we don’t have time? Here are a few practical tips to help you get on the right track when it comes to exercising. A gym membership is a great way to keep you committed to working out on a regular basis (you’re paying for it, right?). It also provides access to lots of great workout machines, and gives you a great reason to get out of the house. If you workout with a friend- or make some new friends at the gym- then an accountability partner is a big help for most women too. 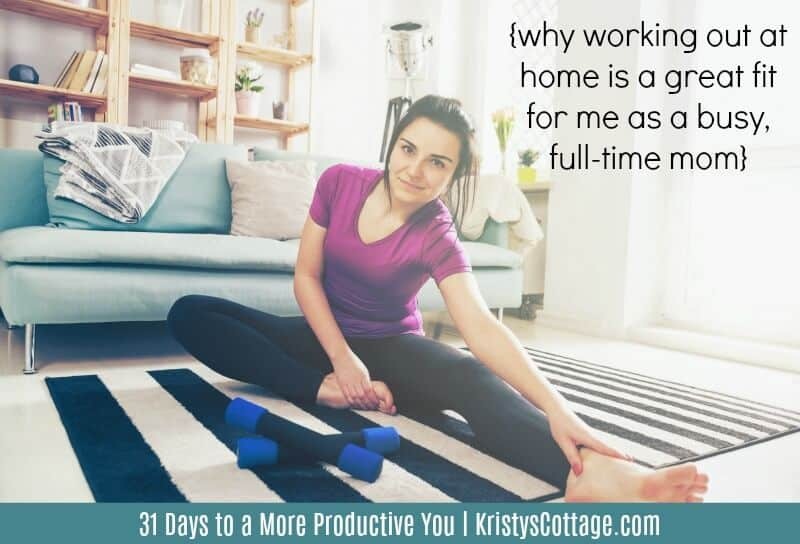 The downside of a gym membership could include cost (anywhere between $30 and $50 a month), and for some women (including me) commuting to a gym in order to work out can feel like an inconvenience instead of a perk. This is what I do, and it’s a wonderful fit for my lifestyle as a busy, full-time mom. In order for working out at home to really “work,” I had to find a way to stay consistent with it. I bought an inexpensive yoga mat and weights from Walmart. I snagged a great pair of Sketchers at a thrift store for eight dollars. I find that a supportive pair of shoes makes a big difference when you’re working out. When I first started working out, I eased into it with super simple routines. I focused on areas I wanted to tone up: my upper body and core (abs), and I only worked out about ten minutes, three times a week. Yes, those are really baby steps. But remember: I had never consistently worked out. So those felt like big steps for me! To keep things simple, I created a “fitness” board on Pinterest and pinned workouts I wanted to try. I saved the ones I liked, and developed an exercise routine that I repeated about three days per week. After about four months of this, I realized that I’d maxed out the benefits I was receiving from my beginner exercise routine. I’d worked up to five-pound weights and was no longer feeling sore after exercising several days a week. After the holidays, I felt like I was ready to kick off 2018 with a “real” work out routine. After five pregnancies, and very little consistent exercising over the years, my core was a mess. I knew I had diastisis recti, and I wanted to heal and strengthen my core. I created a free account with Moms Into Fitness and purchased a postnatal workout routine for fifteen dollars. Right now, I’m five weeks into Lindsay Brin’s twelve-week Postnatal Slimdown. I exercise four to five mornings each week for about thirty to thirty-five minutes. I’m using eight-pound weights, and yes, I’m sore most days! my diastasis recti is slowly healing! One of the biggest positive results is that I actually look forward to working out! I feel so much better that it no longer feels like a drag to pull on my workout clothes and grab my weights. I want to workout, because I want to keep experiencing the results. So how do I find time? I just make it happen. Since it’s one of the top priorities on my priority grid this year, I choose to carve out time in my day to workout. I’m less apt to shift gears and workout in the middle of the day. I feel fresh and ready for the day after a brisk workout and shower. I have so much more energy when I work out in the morning! I love starting the day feeling accomplished and energized. Since I’m a firm believe that rest is also a productive habit, I don’t get up crazy early in order to work out. Working out a few morning every week also means that I have to prioritize what I’m not going to do on those particular mornings. I can’t do it all, but I have been successful in squeezing a thirty-minute workout into my day about four mornings a week. To make my morning workout happen, I get up about at least an hour before my kids. This gives me time to workout, shower, get ready for the day, and then have some quiet time to read and pray before the day kicks into high gear. This is my morning routine at least four days every week; other days, I sleep in or get up and tackle other priorities. On the days when my schedule gets wonky and I don’t squeeze my workout in as early in the day as I’d like, I still stick with it. I give my kids something to do, and tell them that Mom is going to be in her bedroom exercising for the next thirty minutes and no one is to knock on the door unless it’s an emergency. If they knock, I remind them that I’ll be out when I’m done and to wait for me to finish. Just setting aside this thirty minutes to exercise, get rid of stress, and focus on my body’s needs makes a huge difference in my day. I’m stronger, more energized and focused, and feel confident that I’ll reach some fitness and health goals this year. 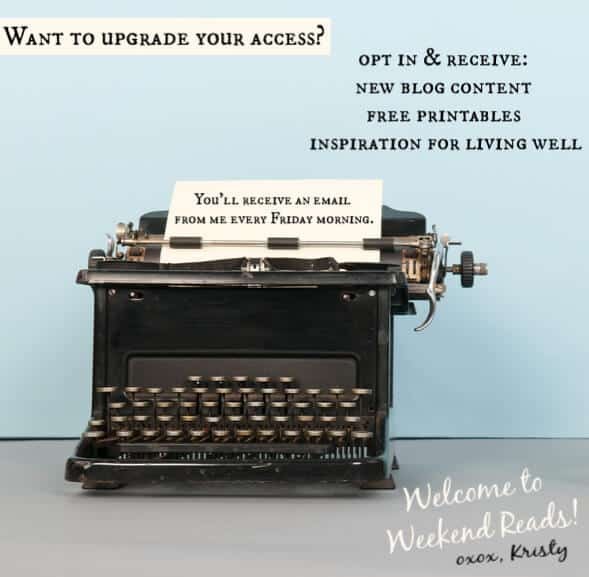 If you haven’t already subscribed to the blog, you can opt in (right here) to receive these posts- and free downloadable worksheets- via email every week. Next Monday, we’ll talk about more habits of self care and why they’re vital to living a productive life. 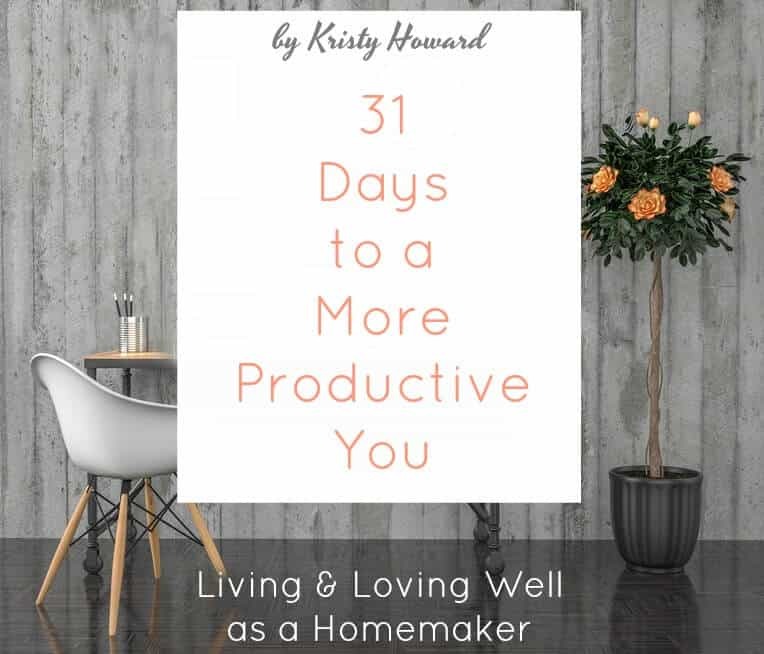 Read the previous chapters of 31 Days to a More Productive You. Download your printable worksheets right here.